The message of Especially for Athletes is one that while carrying special importance to athletes is for all people to try and follow. The idea of having our “Eyes Up” has several areas of importance. One of those comes in times of sorrow and heart ache. 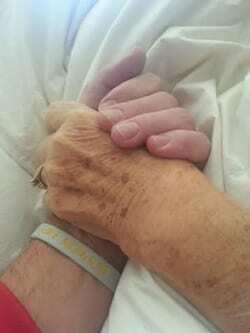 This photo is one of a father wearing his Eyes Up-Do the Work band at the passing of his grandmother. She was a proud supporter of E4A and one of the very first people to purchase the Especially for Athletes book last spring and share it with friends and family. In these difficult times we can turn our Eyes Up and find comfort in knowing that I life spent with eyes that look out for others, and a lifestyle of “Doing the Work” to help lift and bless those around us, is one that we can be proud of when our turn comes to leave this earth. Eyes Up! Do the Work!